"Hillary Clinton supporters say Secretary Clinton is not ill. Oh really? Then why is it right in her name?" Here is what some [a lot] of the headlines looked like after Donald Trump spoke at a rally yesterday. Considering 60 percent of people are not likely to read past the headline, this, for a majority of people, becomes the story. Clinton is a bigot, according to the man whose list of communities or members of those communities he has slammed or mocked over the past year is impressively large, if you’re impressed by, you know, bigotry. Colbert continued, with a quintessential distillation of a Trump speech. 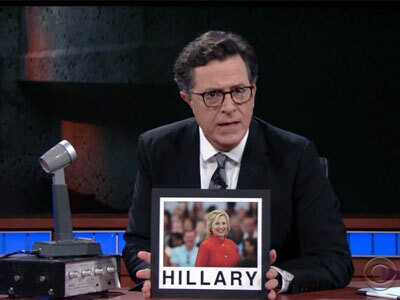 Colbert also took on the Clinton has an illness conspiracy theories, cobbled together from some timelines, a few photos and videos and a lot of armchair physicianship. The set-up began with a clip of Karl Rove on the Kelly File, lifting up a series of whiteboards as a visual aid to lend support to Rove’s claims that Hillary Clinton has a serious illness. “There are so many things that the puppet masters of politics don’t want us to know,” said Colbert as prelude to a segment he titled The Late Show Presents Stephen Colbert’s Tinfoil Hat. Other visuals follow: his own whiteboards. A magna doodle. A bottle of hidden Valley Ranch.